Our smart charger is fast – but how fast, exactly? 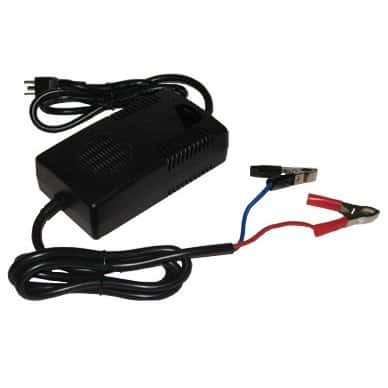 How long would it be for our 12V Lead Acid Battery Charger to take a 12v 20Ah from zero to 100%? In theory, a 20 Amp Hour battery will take 2 hours to charge. There are a couple things that come into play. First, the battery has to be rated for that fast of a charge. Some SLA batteries are only rated for 1/3C for charging (basically 1/3 of 20, so 6.6 Amps maximum charge). So to charge a 20AHr battery you would need a 0.5C charge rating on the battery. Another thing is that batteries never store exactly what they are rated for, typically it’s more. Ultimately, as the battery charges, the 10A rate decreases. It’s not good practice to fully drain your battery – if you do, the charger probably won’t be able to feed a full 10A to it. So if your battery has a 0.5C charge rating (this is a different number than the discharge rating) and it’s rated for 20Ahr, a 10A charger will probably take 2.5-3 hrs if its fully drained. If you are trying to get the most life out of your battery, don’t fully drain it, and charge it as slowly as your patience permits. At least keep it below the charge ratings of the battery. Same goes for discharge – to prolong the life, never discharge faster than the mfg recommended discharge rate.